I'm having hard time understanding the principles of piezoelectric crystal oscillators. I understand that "load capacitance" is something you have to connect to a crystal. I understand that this basically means having to connect an external capacitor in parallel to the crystal. I also realize the basic principle of piezoelectricity; voltage/electric field across the crystal will physically deform the crystal, and the deformation also creates an electric field. So why is load capacitance needed? And if it's always needed and it's fixed, why is it not included in the crystal package? Is it because we need to sometimes operate it in series mode instead? In the equivalent circuit diagram, there is already a capacitance, Cp, parallel to the series resonant arm. Why do we need even more capacitance in parallel to that? In the picture I provided, there is a curve showing impedance of the crystal with respect to frequency. Why isn't the load capacitance showing in the formulae for the resonant frequencies? An internal capacitance appears inside the crystal case (Co). It is the capacitance between the crystal surfaces, with quartz as the dielectric. This capacitance is shown in your crystal model circuit as "Cp". This capacitance appears in parallel with the external capacitance (Cp) that your circuit adds. Stray capacitance is included in Cp. Where you see a crystal specifying a load capacitance, it is generally expected that you would use it in a parallel-resonant circuit, where crystal impedance rises to a maximum, and voltage across its terminals peaks at the desired operating frequency. The operating frequency can be adjusted by varying the external parallel capacitance Cp. Shown below is the voltage across two identical crystals. For both, the internal parallel capacitance is 3.5 pf between the crystal terminals. The green plot shows parallel resonance at 4.5096 MHz of this bare crystal. It would be difficult to operate this crystal above this frequency. The red plot shows the same crystal loaded with a parallel 12pf. Its parallel resonance has dropped to 4.5034 MHz. Note that series resonance for both crystals is 4.5016 MHz. Operating below this frequency would be difficult - some extra inductance would be needed in series. When operated as a parallel-resonator, you can adjust operating frequency in the range of 4.5016 - 4.5096 MHz. by adding an appropriate external Cp. It is a very easy and cheap way of tweaking frequency. 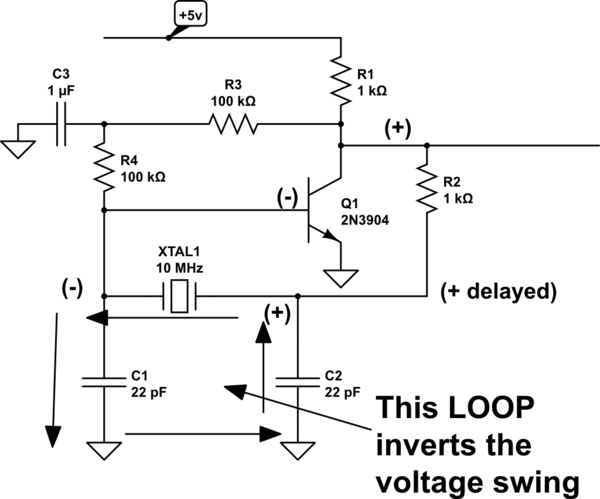 For an oscillator, a sustaining amplifier is required. It will likely add some extra phase shift that also affects frequency. An adjusted Cp can compensate. Quartz crystals do not operate in vacuum in real world. They are usually connected to an amplifier in a feedback, so they are "loaded" with input capacitance and output capacitance. These capacitances cannot be avoided. However, if you add these caps, the resonance frequency (more specifically, a frequency point where the provided feedback turns 180 degrees at gain 1, or whatever) will be different from formulas you listed. Therefore, the actual frequency cannot be specified without knowing the value of load. And this load depends on PCB design (traces/pads), and pin capacitance of different ICs. So, instead of making crystals for unspecified "thin air", manufacturers make the crystals to certain pre-defined load, say, "12 pF". The task of product design engineer is to meet this load with external capacitors, the value of which must be reduced for particular board parasitics and for particular pin capacitance of the IC in use. Not the answer you're looking for? Browse other questions tagged oscillator crystal piezoelectricity or ask your own question. What is the meaning of the nominal frequency specified by manufacturers of crystals? What are quartz crystal oscillators?